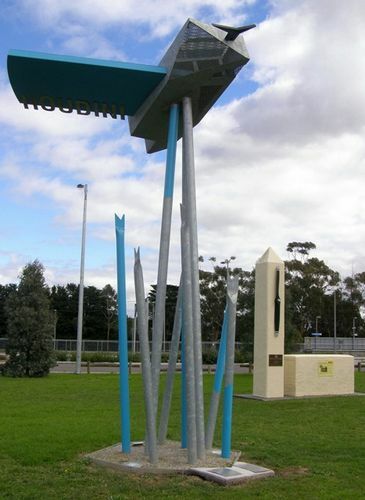 A monument with tall poles to echo the grass lands, and a structure that is influenced by Houdini’s Voisin Biplane commemorate the centenary of first powered flight in Australia by Harry Houdini at Diggers Rest in 1910. On March 18, 1910 whilst on a visit to Australia and in a Voisin biplane (purchased for US$5,000 in Hamburg, Germany prior to the trip ), Harry Houdini made the first controlled, powered flight of an airplane in Australia, at Digger's Rest in Victoria, Australia. The community of Diggers Rest acknowledge famous escapologist Harry Houdini as the first person to make a successful controlled, powered and sustained flight in Australia at "Plumpton Paddock", Diggers Rest in a Voisin biplane on 18 March 1910. He achieved 3 flights on 18 March 1910, the longest being 3 mins 30 secs. Certified by the Aerial League of Australia. The community of Diggers Rest acknowledge famous escapologist Harry Houdini as the first person to make a successful controlled, powered and sustained flight in Australia at "Plumpton Paddock", Diggers Rest in a Voisin biplane on 21 March 1910. Flight duration 7mins 37 secs. Height achieved 100ft. Certified, timed and witnessed. Mayor Of Melton Shire Council 21 March 2010.